Early steps in preparation for the next generation of trains in Perth to be know as "C-series". A minimum of 50 six-car trains over a 10 year period which equates to 300 railcars. Currently there are 48 two-car A-series trains (96 railcars) and by the end of the delivery of the final B-series trains there will be 68 three-car trains (204 railcars). If the delivery commences around 2017/18 (after the completed delivery of final B-series), by the second half of the next decade, the railcar fleet will have doubled in size to 600 railcars. The State Government is about to take the first formal steps to acquiring a new generation of trains. Transport Minister Dean Nalder today announced the Public Transport Authority (PTA) would go to market with a Request for Information (RFI) about the new trains, which will double the size of the Transperth fleet. He said the RFI process was designed to gauge the level of interest from potential suppliers. “This Government is taking the prudent and responsible step of going to the market to assess who could design, build, deliver and maintain the railcars,” Mr Nalder said. “The RFI outlines the requirements for the next generation of trains for the Transperth network, to be known as the C-series. It outlines the scope of the project to deliver a minimum of 50 six-car trains over a 10-year period. “Clearly this will be a huge contract, particularly because it will involve a long-term maintenance arrangement. The purpose of this RFI is to get an early indication of how many companies would be able to deliver such a large order of high-quality railcars. The Minister said anticipated patronage growth on the Transperth network, coupled with the expansion of the network with exciting new projects such as the Forrestfield-Airport Link, were the driving force behind the RFI. “This is very early days in this project. Once the PTA has received submissions, it will complete an evaluation for the Government to consider,” he said. 1) The specification shall enable open and competitive tendering. 2) The proposed railcars shall be proven to be suitable for supporting high performance metro/urban rail operations, at speeds of at least 130km/h with journey times to match the existing urban timetable across all PTA lines. 3) The proposed railcar set shall be of a length of approximately 144 metres, the maximum distance from the leading edge of the leading doorway to the trailing edge of the trailing doorway shall be approximately 135m. 4) The proposed railcars shall maintain or improve current overall levels of safety. 5) The proposed railcars shall provide a suitable, easily re-configurable passenger environment. 6) The proposed railcars shall provide a passenger carrying capacity in excess of 1150 persons, standing area is calculated in accordance with EN 15663 and loadings of 6 passengers/m2 are applied to vestibule areas and 4 passengers/m2 in all other areas of the cars. The proposed railcars shall support the reduction of station dwell times with double leaf door portals spaced at intervals no greater than 5.5m on each vehicle side (equivalent to 4 doors per side of a 24metre vehicle). 9) The proposed railcars shall be capable of rescue of/by the PTA existing Rolling Stock fleet. 10) The proposed railcars shall support future developments of the PTA network including the upgrading of signalling/train control and digital radio communication systems. 11) The proposed railcars shall provide high levels of availability and reliability to meet with PTA operating demands. 12) The proposed railcars shall provide train operators with decision support systems for easy recovery from railcar faults. 13) The proposed railcars shall allow services to continue in degraded modes, with graceful degradation in case of failures. 14) The proposed railcars shall provide dynamic passenger loading data to a centralised monitoring station. 15) The proposed railcars shall support the remote provision of information to customers about delays and subsequent service recovery. 16) The proposed railcars shall enable efficient use of energy resources. 17) The proposed railcars shall contribute to improving customer satisfaction for public rail transport in Perth. 18) The proposed railcars shall be designed to facilitate easy upgrade, expansion and change to accommodate future infrastructure extension and the addition of new stations on existing lines. WA’s train fleet will be doubled over the next 10 years, with the Barnett Government announcing it will spend $500 million on new rail cars. However, it wont happen until 2019, despite the state’s well-documented congestion woes. Treasurer Mike Nahan said 300 C-series rail cars would be bought over the next decade, starting with a $1.2 billion spend in 2019. Planning for the project will begin soon, with $5 million set aside for 2015-16. There is no money in the budget for planning on the stalled MAX light rail project. Edit: And public transport costs to rise 2.4 per cent on a two-zone fare. The $1.2 billion investment includes money previously set aside as part of the Forrestfield-Airport Link project. Planning for the rail car project will begin soon, with $5 million set aside for 2015-16. Mr Nahan released a statement which said the new railcars would have four doors on either side. Current railcars only have two doors on each side. This $2 billion project is due to start in 2016. Last edited by TP1462 on Sat May 16, 2015 10:58 am, edited 1 time in total. The newest train on Perth’s rail network starts service tomorrow, marking the halfway point in the State Government’s purchase of 22 B-series trains at a cost of $244 million. The three-car train, which carries up to 600 passengers, is the 11th new train in the B-series. Transport Minister Dean Nalder said once all 22 trains arrived, the Transperth railcar fleet would number 300, representing a 28 per cent increase in the fleet since 2011. Treasurer Mike Nahan said the commissioning of the new train coincided with this week’s State Budget announcement of $5 million in 2015-16 towards the planning and procurement of the next C-series of railcars, worth a total of $1.2 billion. This will allow the Public Transport Authority to issue a closed tender to several proponents who responded to the request for information last year. The successful proponents will be asked to deliver 50 six-railcar trains, or 300 railcars, over 10 years, starting in 2019. They will be constructed in a fixed six-railcar configuration, which increases passenger carrying capacity. The number of doors per railcar will be doubled to speed up passenger boarding and alighting, which will reduce waiting times at stations, making the whole network more efficient. “We are also looking at ways to integrate technologies such as USB ports and wireless internet on services,” Mr Nalder said. There is now a project page on the PTA website for the next generation trains. $1.2 billion for next generation of Transperth trains, known as the C-series. 50 new trains over 10 years from 2019 to meet expected demand in growth by doubling the Transperth train fleet. Reducing the time a train is at a station will ultimately make the rail network more efficient. The new C-Series trains will service the Joondalup and Mandurah lines, which have the greatest level of forecast future demand. The B-Series, which currently service these lines, will be cascaded onto the Fremantle, Midland and Armadale lines as well as the Forrestfield-Airport Link when it is due to open in 2020. The C Series Trains will run along the Joondalup and Mandurah Lines due to the increased passenger demand. As what Mr OC Benz was saying about the B Series trains, they would run along the Armadale, Midland and Fremantle Lines. I reckon that the B Series Trains would still run along the Joondalup and Mandurah Lines. Not sure what the PTA would do about the A-Series Trains as these railcars would be about 20-27 years old. I guess that the A-Series Trains would still run on the Thornlie Line when this happens. Shoudy Chen wrote: I guess that the A-Series Trains would still run on the Thornlie Line when this happens. I'm not entirely sure why the PTA would do this. This sentence is probably just in error. I wonder how the B-series trains will go on the heritage lines. Will the frequent stopping and starting kill their brakes (edit: no, traction motors, whatever they are )? Also, six car B-series sets are too long to fit the platforms. Will they be operated only as three car sets? Will this impact on capacity along the lines? Will the government spend millions to lengthen the platforms? Or will the trains only open select doors at each station (e.g. front four cars). Will this increase dwell times? Maybe it would be better to using the C-series trains primarily on the heritage lines and leave the B-series trains to work the Joondalup/Mandurah trunk that they were designed for. Or perhaps (this is quite a stretch) we could remove some of the little stations on the older lines to speed up journey times and provide buses instead (just a thought). Last edited by 102 at 1625 on Fri May 29, 2015 11:55 am, edited 1 time in total. 1625, brakes aren't the killer for B sets on heritage - traction motors will burn out on them. Off The Rails wrote: 1625, brakes aren't the killer for B sets on heritage - traction motors will burn out on them. In mid-2015 the Western Australia Government committed $1.2 billion for the next generation of Transperth trains, known as the C-Series. The funding will allow the Public Transport Authority to deliver 50 new trains over ten years from 2019 to meet expected demand growth by doubling the Transperth train fleet. The contract to design, build, deliver and maintain the new generation of rail cars is expected to be awarded in late-2016. The C-series is intended for increase demand in growth plus new rail lines that are built. It'll double the amount of railcars in the existing fleet and would be interpreted to assume that they are not replacements for A-series. General usefulness of railcars extends to about 35-40 years. As new trains are delivered each year, B-series will cascade to the heritage lines and operate alongside existing A-series on the lines which in turn provides greater capacity and the opportunity to increase frequency. The C-series specifications are specifically to cater for the increase in demand on the network which will be felt most on the Joondalup and Mandurah Lines. You also forgot that the C-series are permanent 6-car configurations, so if platform lengths were not extended on heritage lines, they would not be able to operate on them anyway... The B-series and their design and capacity limitations will not work in favour with running trains closer together and maximising available capacity on the two busiest lines however. Removal of smaller intermediate stations on lines is definitely not a consideration anymore. The majority of these will become local precincts containing mixed use and higher density residential development. Will this lead to a pensioning off of some of the A sets which the oldest are now over 24 years old and will be a few years older by the time the first C sets arrive? Don't think so. I think you'll find there will be a major consolidation of timetables once the C sets are delivered en masse. I can see all Mandurah/Joondalup/Airport line services being operated by C sets and 6 car B sets used on the heritage lines to supplement 4-car A sets (along with a major improvement to peak-hours frequencies and stopping patterns). You'll probably find that there will be no more 2-car set workings. That would be fine Dwave so I would have no problem with no more 2 car sets! I do have some strong views about the C series railcars. The C series could travel much faster than the B and a series cars and would have lower carbon emissions. With the new generation railcars, these trains are 28% cleaner and quieter compared to other railcars in Perth. These trains has a maximum speed of 130km/h. With the new C series railcars, they will be slightly taller, wider and longer than the B series train. Hopefully, I would hop on this train one day! It has already been stated the new C-series are for expansion will service the the Joondalup and Mandurah lines, which have the greatest level of forecast future demand. B-series will be cascaded onto all the other lines including FAL. The C-series will have equivalent (or better) acceleration and speed to the existing rolling stock. They can't possibly be any wider or longer than existing rolling stock. 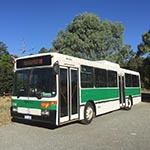 Mr OC Benz wrote: It has already been stated the new C-series are for expansion will service the the Joondalup and Mandurah lines, which have the greatest level of forecast future demand. B-series will be cascaded onto all the other lines including FAL. The C-series will have equivalent (or better) acceleration and speed to the existing rolling stock. They can't possibly be any wider or longer than existing rolling stock.